Marketing Ideas & Professional Services & Sales & Marketing for Professional ServicesReputation IS a Personal Brand - and it is what matters most	Professional Services & Quick Tips Videos & Sales & Marketing for Professional Services & Sales & SellingA Little Kickback On The Sly For Referrers Is OK Isn't It? 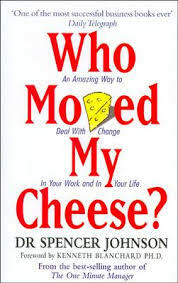 I was moved to dig out my copy of “Who Moved My Cheese” this week, and a quick review of it again made me think that it is a very handy reference guide for financial advisers the world over right now. This easy little read is all about the process and the mindset of handling change, which of course has pretty much become a constant in the advisory world in recent years. It also appears to be a constant dynamic for some time to come too. What moved me to refer to it again was a discussion with a couple of advisers who were asking for my honest assessment of “when all the change will stop?“. My honest answer, though they thought it flippant at the time, was “it won’t; it will only accelerate“. My bold (and I believe 100% accurate prediction) is that change will constantly accelerate in the areas of regulatory requirements; professional practice standards (which should differ from regulatory requirements if we are to evolve as a profession); consumer expectations in transparency, speed and value; and; implementation of new technology and communications mediums. Change Happens. The world will keep moving and evolving whether you want it to or not. Anticipate Change. Be ready for the changes that are reasonably foreseeable or predictable. Monitor Change. Keep reading industry news, talk to peers, pay attention to consumer research, regulatory reports and divergent views from around the industry. Adap t to Change Quickly. The quicker you let go of the old way, the sooner you can thrive in the new era. Change. Do it. Don’t constantly be getting ready to get ready, and never actually doing it. Enjoy Change. Savour the adventure…as we do with new restaurants, holiday destinations, relationships…pretty much anything else in life. Embrace and take the positive experiences that you can out of it. Be Ready To Change Again. The cycle will repeat. New changes will happen. Financial advisers can pretty much count on that as our constant too. Things will keep changing and evolving.